Setting out to entertain a toddler can be a challenge in and of itself, but when you are a work from home mom, your day may seem like a total juggling act! Between making sure your kiddo is fed, happy, and has a clean diaper on all while trying to work, things can get pretty hectic. Life can be even crazier if you don’t have a helping hand at home which, may not be realistic for everyone to have. If you’re a work from home mom, trying to balance it all, keep reading to learn some tips on how to entertain a toddler while you get some work done. To buy you some time to get some productive work time in, try setting up an area in your house that’s gated off and baby-proofed for your toddler to play in. Have this set up next to your workspace so you can watch what your little one is doing while working. Put lots of toys in there to entertain them, and even consider playing some music to keep things upbeat and fun! Use this space as their dedicated play area while you work, and set certain “play times” throughout the day where you know you can let your kiddo play while you work. Not only will this allow you to get some work done, but it will help establish a routine for your toddler. Toddlers get bored quickly, so you will want to rotate their toys. After the morning playtime is done, swap out those toys for new ones that he or she can play with after lunch. This doesn’t mean you have to buy new toys, you can just put out a handful of the toys you already own at a time. Swapping out toys will help keep your toddler entertained for longer periods of time which means you get to get more work done. It’s a win, win. Prepping meals and snacks for your toddler can be super time consuming, so plan to prep these the night before. When you have these things ready, you can get more work done, and you can spend more time planning activities to entertain your little one instead. During lunch and snack time, think about putting on an educational TV show if you’re okay with a small amount of screen time. Now, I’m not talking about sitting them down in front of the TV for hours, but twenty minutes or so during meal time could give you some valuable time to really focus on something that needs to get done. Plus, there are some excellent educational shows available! One of the best ways to keep your little one entertained is to set up regular playdates with other moms! You can take turns with who gets to supervise. On the days another mom is watching your toddler, you can get a huge chunk of work done. 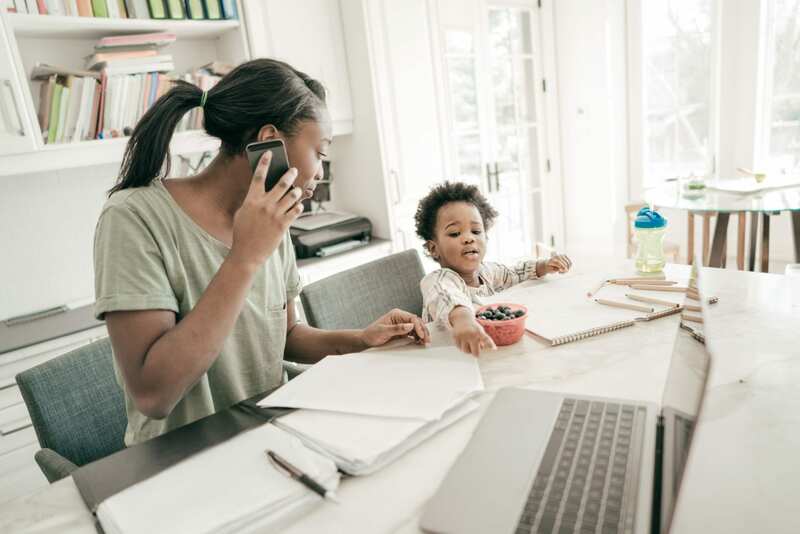 Being a work at home mom certainly has its challenges, but it also means you will never miss an important milestone your toddler reaches, you will be right there with them each and every day. If working from home is new to you, know that it takes some time to adjust and that creating a routine is essential! If you can create a routine for yourself, but also for your child, you will be so much more productive. Try implementing these tips to help keep your toddler entertained, and try to take things one hour at a time. Once one activity is done, move onto the next. Just remember to have a daily plan in place, and before you know it you will be balancing work and mom life like a pro.